So here’s what to expect! Yes, we’ll do ATM lessons. We might do two. We might do parts of several. But we’ll certainly be getting down on the floor. Having three hours to play with means we can stop and start. Pause for discussion or demos. We can also do extended lessons which are too long to offer in an hour class. Sometimes I’ll invite you to work with one or two other people to investigate something together, maybe in moving, maybe in discussion. We’ll do some talking about what we’re discovering. Each of us will make unique discoveries during each workshop, and over the series. We’ll probably find common threads. Naming and describing what we discover will help us decide whether our discoveries are useful—do we want to keep traveling in that direction?—or whether we’ve found something to change or improve. As Moshe Feldenkrais wrote: “When you know what you’re doing, you can do what you want.” Part of knowing involves naming, really bringing your attention to what’s going on. If you like, you can take one or two of the ideas from each workshop and continue to play with them on your own, during the month. Over the six months, your toolbox will grow. You may surprise yourself. I once taught a rolling lesson. During the lesson I said, “You’ll never do these movements in this way in real life. The point of this lesson is flexibility.” Then I found myself getting into my car after class, tapping into part of the lesson to pivot, fold, and twist, all at the same time. Spontaneously and effortlessly! 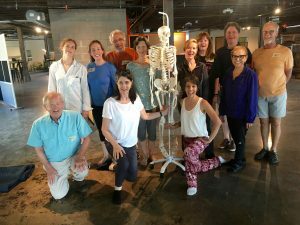 This entry was posted in Awareness Through Movement, Workshop on December 6, 2018 by DallasFeldenkrais.